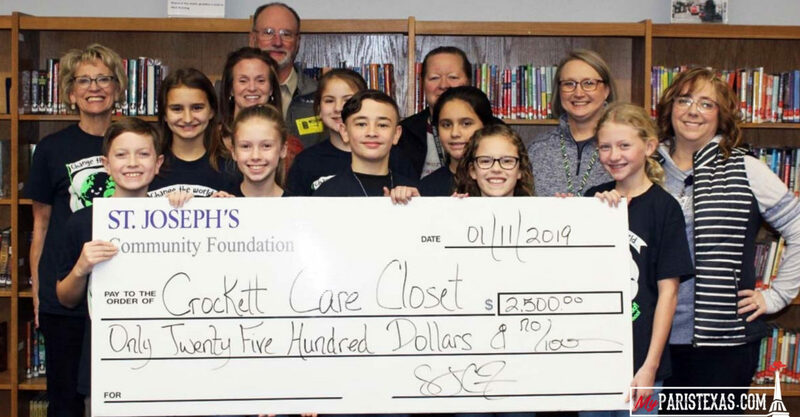 The Crockett Intermediate School Care Closet received a generous $2,500 donation from St. Joseph’s Community Foundation. Crockett students receive basic necessities for health needs on a weekly, and as needed basis, through the Care Closet. The Care Closet will be better stocked with the addition of these funds. Pictured (from left) on the front row are Grant Frierson, Ryan Sadau, Beckett Hubbard, Anna Grace Blassingame, and Ashley Phifer. On the second row are Debb Fleming, Annie Gibbons, Abby Polak, Marceila Hignight, and Paula Alsup. On the back row are Louisa Kessel, Jerome Chapman, Cecilia Lester, and Denise Kornegay.